The place to get all the latest updates on what's happening at Wasatch Barricade. We’re Expanding Our Fleet to Serve You Better! Today we put into service three brand new Ford F350 Heavy Duty barricade delivery trucks. By expanding our Fleet, we will be able to better serve our Customers along the Wasatch Front. 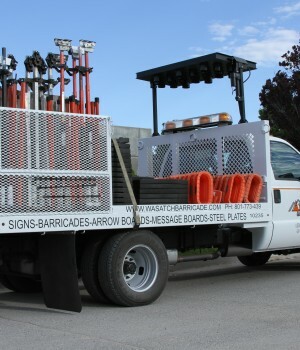 Each truck is outfitted with a custom designed flatbed and is capable of holding a large variety of 4’X4′ signs and stands, as well as vertical panels, traffic cones, and the ever famous orange barrels. This brings our total fleet of delivery trucks to 12.